Since turning professional in 2005, Murray’s big breakthrough success at the very top level of the game, came at the 2012 US Open. Prior to Murray’s win at Flushing Meadows, where he beat world number one Novak Djokovic in five sets, the Scot had suffered defeat in four previous Grand Slam finals. Murray’s first Grand Slam final occurred at the 2008 US Open and back to back final defeats at the Australian Open in 2010 and 2011, saw him suffer again in 2012 at Wimbledon. He did however, achieve the feat of becoming the first British male to make into a Wimbledon final since 1938. However, a four set defeat against Roger Federer meant that he would have to wait a while longer for his first Grand Slam title. The resiliency and determination of Murray won out, breaking through for his maiden Grand Slam final in an epic encounter against Novak Djokovic. With the win, Murray became the first British male to earn a Grand Slam title since 1936. The first ATP Tour title for Andy Murray came in 2006 when he won in San Jose. Further breakthroughs in his career came in winning his first ATP World Tour Masters 1000 event in 2009, taking titles in Canada and Miami. 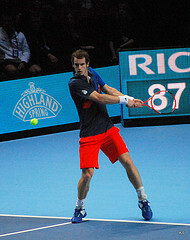 Murray was also successful at the 2012 London Olympic Games, beating Swiss tennis star Roger Federer in straight sets in the final, claiming his first Olympic Gold. Murray added the honour of becoming the first British player to win the Olympic tennis gold in singles since 1908. Andy Murray was awarded an OBE in the 2013 New Year Honours list by Queen Elizabeth II.